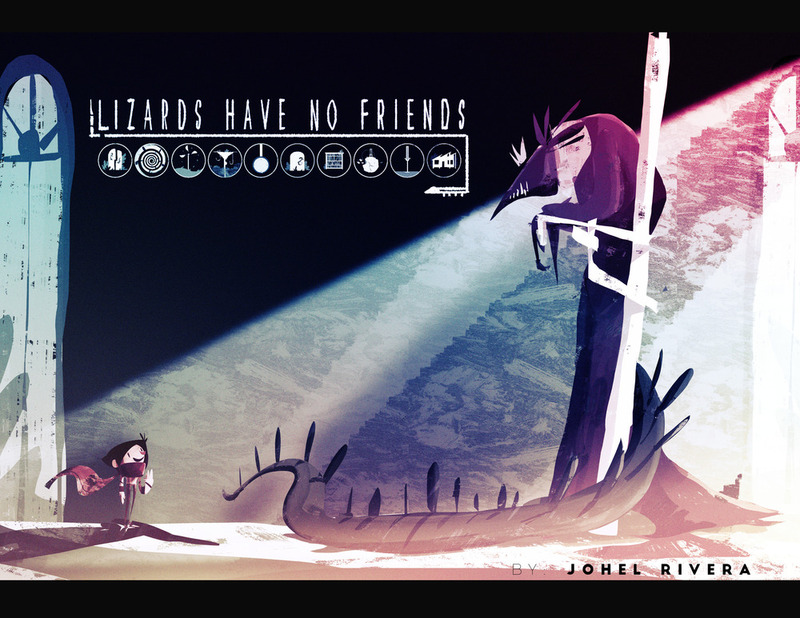 Lizards Have No Friends is a personal project I'm currently developing, an interactive story that will help people make a transition from loneliness to solitude. In a time when we are so connected, how come we are so lonely? I believe in the power of stories, therefore this one revolves around the concept of Healing through Storytelling, an idea I’ve been pondering on for a while. This story does not pretend to cure loneliness; it is not a guide to teach people how to be with others. Instead it looks to help people make a transition from Loneliness to Solitude. By finding the positive aspects of being alone and make the best out of it. Solitude is one of my favorite words in English; we don’t have an equivalent in Spanish that embodies such a positive attitude toward being alone. This story is a journey in a different world. In each of its chapters a different type of loneliness is introduced, represented by a different kind of lizard-character. You are a kid in this story; an agent of change that will provide a different perspective on each lizard problem, allowing them to move on and carry on. -Sherry Turkle, Connected but Alone, Ted Talk.